In 5-quart Dutch oven, heat oil over medium-high heat. Add sausage, onion, carrots, basil and garlic; cook 5 to 7 minutes, stirring frequently, until sausage is no longer pink; drain. Stir broth, tomatoes and great northern beans into sausage mixture. Heat to boiling. Reduce heat to medium-low; cover and cook 7 to 8 minutes, stirring occasionally. Stir in macaroni, zucchini and frozen green beans. Heat to boiling. Cook over medium-high heat 5 to 6 minutes, stirring occasionally, until vegetables are hot and macaroni is tender. It's easy to make this soup meatless. 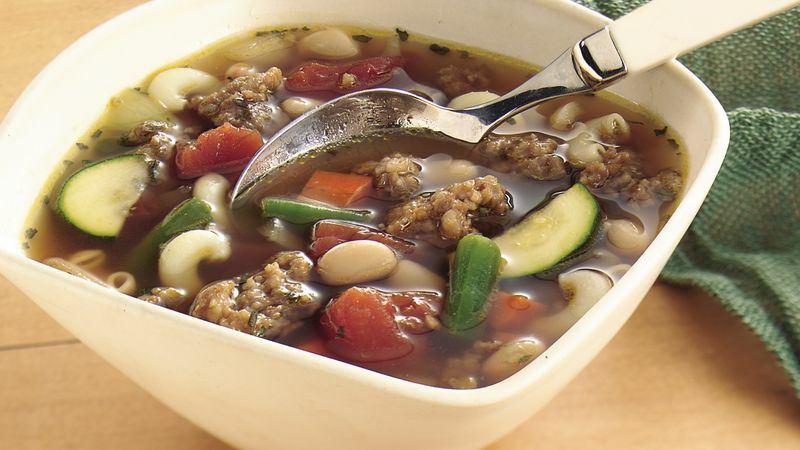 Simply substitute an additional can of great northern beans or your favorite canned beans for the sausage and use vegetable broth instead of beef broth. Top each serving with a little chopped fresh basil or a fresh basil sprig for an extra burst of color and flavor.